Halloween Edition: Leung Kai’s Ghost Story – Remembering a Modern Choy Li Fut Master. 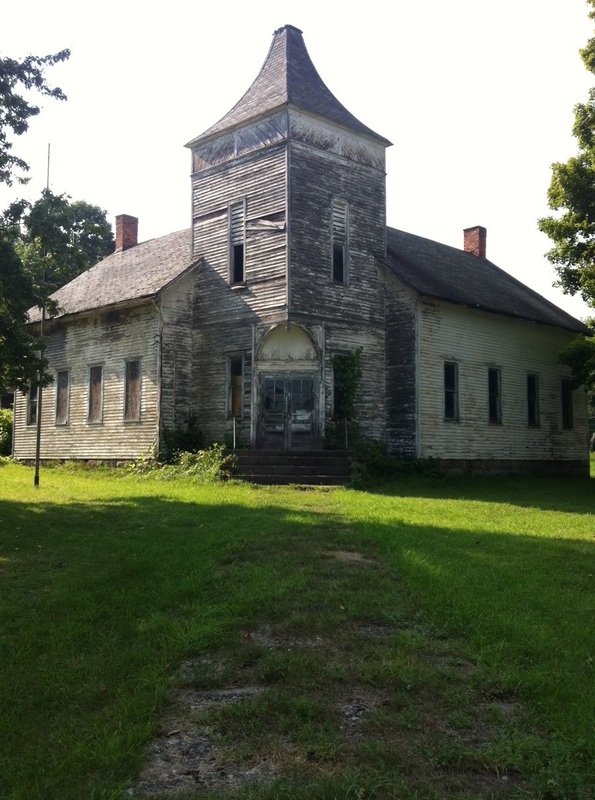 An abandoned building (formerly a 19th century shoe factory) in Wyoming County, NY. Source: Photo by Benjamin Judkins. Author’s personal collection. Once again I find myself staying up late to write my Monday morning post. I had originally planned on doing a news update, but given the hour I thought a ghost story might actually be more appropriate. The following post is something of a departure from what I normally offer, but I think that a variety of readers will still find it interesting. I don’t normally present translations, nor do I spend a lot of time discussing obituaries, but in the current case I am willing to make an exception. Choy Li Fut students (particularly those from Canada) may be interested in reading a little more about Master Leung Kai’s life and contribution to their art in both New York City and Montreal. Others reader may be more interested in what his life’s story suggests about the globalization of the Chinese martial arts in general. Lastly, as I was doing the research for this post I became interested in the differences in how his life story was presented in local Chinese language community newspapers versus English language sources. Not only were these accounts richer and more colorful, but they painted a more more complete picture of the place of the Chinese martial arts in the local community. Reading between the lines of these articles it seems that Leung Kai’s school occupied a slightly marginal place in the broader social structure of Montreal’s Chinese community. While the obituaries themselves are unrelenting laudatory, the life story that they tell is actually more complex than it might first appear. When Leung Kai first appeared in Montreal it was as an employee in an unremarkable local shop. While he had studied the martial arts as a child (and apparently taught them in New York City and Hong Kong) he did not at first have an outlet for those talents in Canada. It was only after the eruption of the “Kung Fu Craze” of the 1970s that Leung Kai was able to devote himself full-time to the traditional combat systems. The “craze” attracted both overseas Chinese and other Canadian students. The Chinese language obituaries even list his senior disciple as being a French Canadian woman. They also strongly suggest that the social status that he achieved in the local community was as a result of the martial arts and cultural associations that he founded. In that sense one may be tempted to read this as a story about “pulling oneself up by their bootstraps.” Yet even in the heady years of the 1970s, Kung Fu remained a somewhat marginal activity. Other aspects of his career also reinforce this impression of liminality. For instance, Leung Kai was not just associated with traditional modes of popular culture, but also spirituality. In some of the stories that are related in the Chinese language sources he almost takes on the aspect of a modern urban shaman. For instance, his reputation as a martial artist was bolstered by an apparent encounter with the ghost of a murdered woman who was looking for vengeance against her killer. We are even told by one author that this was one of the main reasons for his fame and ultimate success in the martial arts. Leung Kai also adopted the then current discourse surrounding Qigong masters and their possession of “extraordinary powers.” In one memorable incident he demonstrates that not only could he teach others to manipulate their own healing energy through qigong practice, but that his touch could directly transfer healing energy to a distressed patient. The success of the operation was “interpreted” by another of his disciples who wrote auspicious calligraphy characters in a mixture of alcohol and ink, performing what amounted to a cross between an act of divination and a Chinese language Rorschach Test. How should we interpret such accounts of modern Chinese martial artists living in hi-tech western cities? Avron Boretz has provided us with probably our best interpretive framework for understanding the nuances of Leung Kai’s ghost story. In his volume Gods, Ghosts, and Gangsters: Ritual Violence, Martial Arts, and Masculinity on the Margins of Chinese Society, he notes that many southern Chinese martial artists are expected to deal with the supernatural realm as part of their normal public performance duties. Of course these are not the modernized, sanitized and globally popular martial artists that we normally encounter in the west. Instead they are more marginal individuals associated with local temples, criminal brotherhoods and the world of “Rivers and Lakes.” What values are the Chinese folk martial arts seeking to express in these less savory settings? Overwhelming they are concerned with “Yang” or masculine virtue. In Chinese popular religion these are seen as the central ordering and productive forces of the universe. “Yin,” or “female” values, are not only not seen as being equally valuable, but they are often seen as a subversive representation of chaos, destruction and decay. These “Yin forces” need to be contained through strict social legislation and ritualized exorcism. This is very different from the sublimely balance of Yin and Yang imagined in Taiji theory or discussed by so many philosophically minded American martial artists. This shouldn’t really be a surprise as the idea of “philosophical Taoism” that is often encountered in western bookstores has never been all that popular in China or Taiwan. In fact, it is basically a construction of of 19th century protestant scholarship (specifically James Legge), which was later adopted by a number of Chinese intellectuals. The world of local temples and their festivals tends to be dominated by ritual rather than learned discourse, and one of the most common rituals practiced are public exorcisms to banish the dark and misty threads of Yin from the public sphere. Beyond this ritual bias, the association of Yang with “virtue” is deeply embedded in many, maybe most, Chinese folk martial traditions. Leung Kai’s encounter with his ghost seems to fall squarely into this tradition. Here the misty and chaotic forces of “Yin” have taken the form of a female ghost who, while ostensibly seeking justice, is bound to be a corrosive and destabilizing force on the community. Recall for instance what happened after Hamlet’s dad showed up. It was up to a priest or martial artists to project a surplus of cleansing Yang to deal with the situation. Interestingly the local Chinese community remembered Leung Kai as an individual who existed within, and could mediate the effects of, this world. This sort of relationship between southern martial artists and the local community has been discussed by a number of anthropologists working in southern China (see Avron Bortez and Daniel Amos). Still, its not something that most western students of the martial arts ever encounter or spend much time thinking about. Its interesting to note for instance that the English language treatments of Leung Kai on his association’s webpage relates none of these more colorful stories. Evidently they did not consider this material to be a critical aspect of his memory as a martial artist. Yet the local Chinese language commentators did? The remainder of the post presents two short obituaries of Leung Kai written after his deal on the 31st of May, 1992. The first of them is shorter and more formal. It’s focus is on biographical information. The second obituary is longer and more colorful. It attempts to remember and editorialize on Leung Kai’s place in the local community. In so doing it touches on a lot of themes (including ethnic and gender identity, social status, and the supernatural) that may be of interest to readers. Before going on I should also note that both of these account were produced by authors in Canada and focus on the period of Leung Kai’s life when he lived in Montreal. Nevertheless, when he immigrated to the west from Hong Kong in 1967 he originally settled in New York City. He was active in the martial arts there and was the president of the “East US Chinese Martial Arts Federation.” After that he moved to Canada. The timeline of his life is a little unclear for a few years but he founded his new martial arts association in 1977. Lastly I would like to thank my bother and sister-in-law, who are currently visiting from Hong Kong, for providing a quick translation of these accounts. 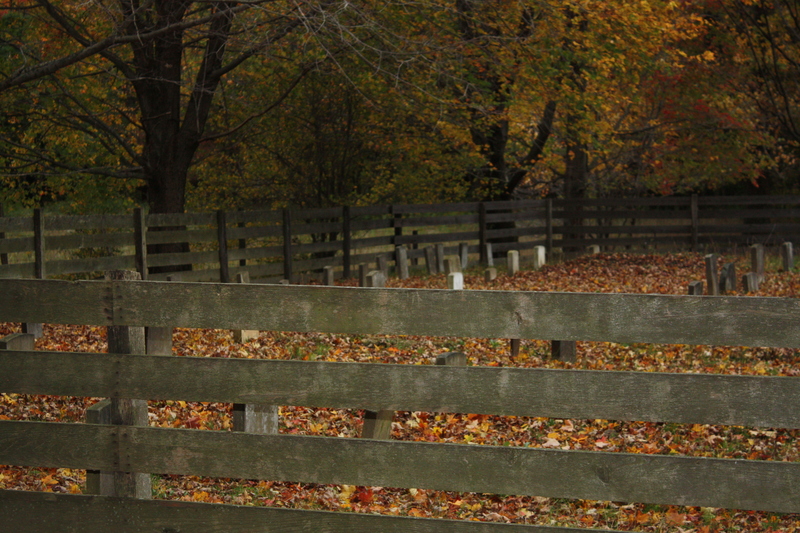 A small graveyard used by the Amish community in the Conewago Valley of Western NY. Source: Photo by Benjamin Judkins. Leung Kai Wan was born in China, Guangdong Province, Taishan County in San Cheung Kei Yeung Leui. He was a very clever youth who liked to learn; he studied under and was taught personally by the Taijiquan Master Wu Kam Chuen and he studied Choi Li Fut in Guangzhou under Master Fong Yuk Su and Master Tam Lap. He then added his own ideas/creativity to found Choy Li Fut Tung Ping. He traveled and took this to other countries teaching Chinese Kung Fu and Taiji, becoming well known internationally; the Chinese living abroad felt it was their honor to study under him. In 1977 he went to Montreal and founded the Leung Kai Chinese Martial Arts Association where he taught Choi Li Fut Kung Fu and Tung Ping Taiji. He had lots of overseas Chinese students and many westerners came to learn from him as well. He was upstanding and well-respected by others, had many disciples and was known for his excellence in teaching. Besides opening his Chinese Martial Arts Association, in 1981 Master Leung founded the Association for the Promotion of Chinese Culture (a legal charity in Canada) to help people to remember to pass along Chinese culture. By promoting Chinese Culture broadly it achieved its objective of East-West cultural exchange. Educational activities included painting, Chinese language, calligraphy, Confucian talks, various performances, exhibitions and discussions for the decade he was in Montreal. He brought great energy into the promotion of Chinese culture and pursued it its greatest extent, giving the overseas Chinese in Montreal the opportunity to learn [authentic] Chinese culture. This demonstrated that master Leung was not only good at Kung Fu, but he did not forget Chinese culture and took it upon himself to spread it. On Sunday May 31 1992 Master Leung passed away in his home at the age of 76. The funeral was held at the Leung Kai Kwok Martial Arts Association and it illustrated his great commitment. 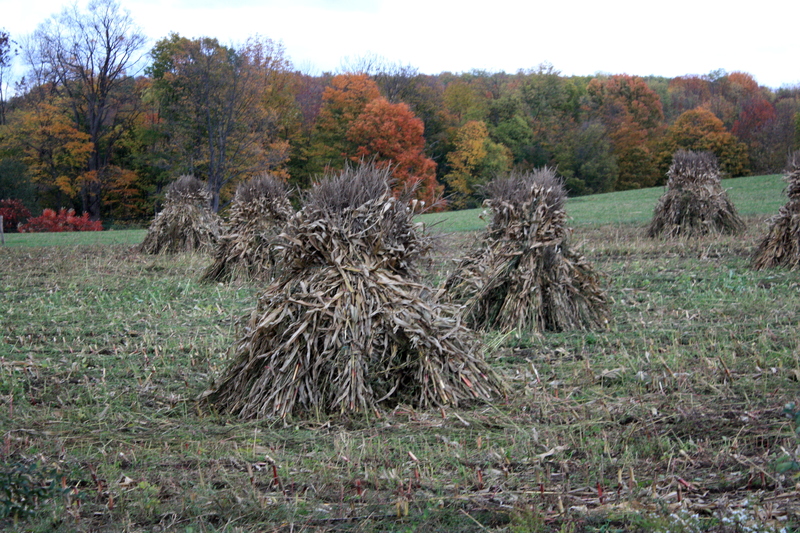 A corn field after the harvest. Conewago Valley, Western NY. Photograph by Benjamin Judkins. “Born of my father, taught by my teacher – I love them equally deeply. In martial arts novels we always hear the story of a martial arts enthusiast who loses his way and seeks out a teacher; when he returns he has become a chivalrous person. In real life there was a story sort of like this, and the protagonist was Mr. Leung Kai Wan. At the beginning of the 1970s Mr. Leung was an employ of a miscellaneous store in Chinatown. Then he vanished. When he reappeared he was a Chinese martial arts master; he opened a training hall and took on apprentices. He didn’t go to the top of a mountain, but was instead invited by the American government to be a teacher of the martial arts [missing character] to the military, and in other American cities he developed the Chinese martial arts. In Seattle the mayor gave him the key to the city. Mr. Leung once gave me an ink painting about the martial arts [missing character]. At the very least we know that he loved the fighting arts. Mr. Leung liked the martial arts from a young age. He first learned from Master Wu Kam Chun and Fong Yuk Syu. Afterwards [he studied] with many more masters. Leung Kai Wan’s lineage is third generation Wu Ka Taijiquan and fourth generation Choy Li Fut. In this way he became a high master. He then took the important parts of various schools of Chinese martial arts and founded Tong Ping Taiji. In 1982 master Leung founded the Association for the Promotion of Chinese Culture and organized celebrations for Confucius’s birthday and received acclaim from both the overseas Chinese community and the Canadian government. For many years he was invited by the Canadian government to attend big celebrations and cultural activities. He was a well-known and respected member of the community. Through his good character and martial arts Brother Tong Ping went from being a store employ to an esteemed master in the Chinese community and respected by the local community. Behind every successful man there is a woman. Mr. Leung had three behind him. The first was his loving and caring wife who took good care of the husband and children so that the entire household was in order and he could focus on developing his career. The second was his female French student, Ms. Ka Bei Hiu, who was more Chinese than even the Chinese people. She respected her master and earnestly studied both martial arts and Chinese philosophy. One time at Mr. Leung’s birthday celebration she won accolades for her Taiji sword performance. She not only helped with the administration of the Association for the Promotion of Chinese Culture, but also organized and assisted public relations efforts including those with the government and other cultural groups. What of the third woman who put the Association for the Promotion of Chinese Culture and the Leung Kai Martial Arts Association on the road to success? Who was this woman? When he was in Hong Kong, on several evenings when he did not have class he went to Wan Chai’s Sau Teun Sports Field where a young woman sought him out to talk. One evening when he was teaching in the martial arts hall the three sticks of incense in front of Guan Yu’s statue all of the sudden rose up and flew at the door. At the same time a girl with the color drained from her face fled from the [entrance to the] school. Afterward Master Leung followed the person to the Sau Tuen sports field and found “Her.” She said she sought him out for help, but the deity Guang Yu refused to let her enter [the school]. She told Mr. Leung she had already found her enemy and hoped that he would avenge her…..As it turns out she was a woman who had been murdered several months before. Mr. Leung told a Hong Kong newspaper reporter about these things and the newspaper carried a detailed story about the occurrence. Because of this incident Mr. Leung deeply believed in the heavenly law of cause and effect, Guan Yu and the existence of spirits. For his whole life he was righteous and took it upon himself to help other people, he used martial arts to strengthen his body and he used truth to convince people; this was the main reasons for Mr. Leung’s success. Mr. Leung is gone but his martial art is in the world forever. Under the guidance and leadership of Ms. Ka Bei Hu the Leung Kai Martial Arts Association and the Association for the Promotion of Chinese Culture can prosper and his energy will always be there. 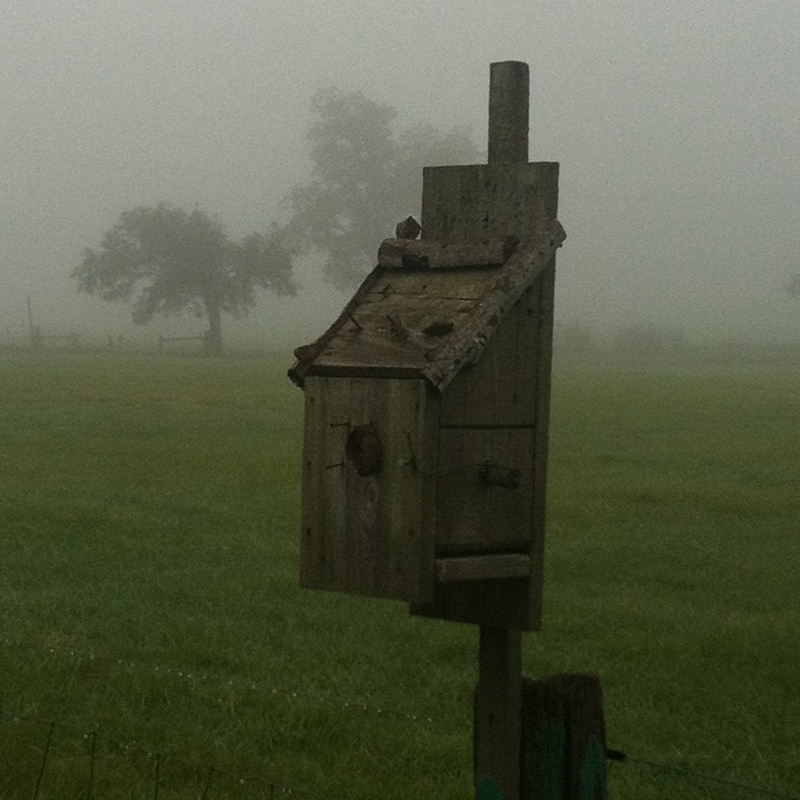 Forlorn birdhouse on a misty fall morning. Genesee Valley, Western NY. Source: Photo by Benjamin Judkins. If you liked this you might also want to read: Reevaluating the “Theater of Combat”: A Critical Look at Charles Holcombe, Popular Religion and the Traditional Chinese Martial Arts. Hi, my brother Stewart and I were the last students personally taught by sifu (Master) Leung Kai. He would instruct my elder kung fu sister (Sidje in Cantonese) Gabrielle Boudreau (Gar Bee Elle….Ka Bei Hui is probably the Mandarin dialect), and she would teach the students and sifu would correct us and/or give us pointers. My brother and I had this opportunity because we were in the “Morning class”…their first attempt of morning classes….and Sidje were available occasionally to teach us because she was going to university. After the summer school break was over the morning classes were stopped, and only resumed about 3 years later. I stand to be corrected. Here’s a very brief history of sifu Leung Kai. When he was a child he was very disobedient and was send to live with his aunt. Even then he was a hand-full (This was his words) and was send to “Live and Serve” the local kung fu master….to get the top of his head “Rapped” to learn discipline. He was not allowed to train in kung fu but he sneaked lots of peeks and started to practice by himself. One day the master saw him practicing and screamed, “Who taught him?”…and Leung Kai said that he watched and learnt 1/2 a form by himself. The master was very impressed and started to train him and let him join the class. During WWII, sifu Leung Kai fought with the Republic of China (Nationalist) against the Japanese. Known for his kung fu prowess and skills he was promoted as a head instructor in kung fu techniques, which included empty-hand techniques, short knife techniques and bayonet (Knife attached to the front of a rifle….skills from spear techniques). He would explain and perform the techniques from an elevated platform, and the assistant instructors-trainers would teach those techniques to the soldiers. During those years sifu Leung Kai said he probably demostrated/taught over 20,000 soldiers. Sifu came to Montreal, Quebec, Canada first, then went to New York city and finally back to Montreal. In the early years he taught very sparingly in the Nationalist Party in Chinatown (The Kuo Ming Tong) as working and putting money on the table was more important (He worked as a cook…as many Chinese men in the 1960s). He was very fat then….he admitted it himself ha ha….and was known at “The fat man” in Montreal’s Chinatown. Later he went to New York city as there were better opportunities. He later opened a Choy Lay Fut school in New York’s Chinatown. It was during this years that he was invited to be president of the United States East Coast Kung Fu Association/Federation. Unfortunately it did not come to a happy ending. Protection racket(s) demanded money and sifu refused to pay. The thugs began to harass and intimidate (Most likely some got beat up also) his students by standing in front of the doorway to keep the students from entering (His school/club was in the 2nd or 3rd floor). After sifu lost all his students he still didn’t pay or close his school. The thugs finally burnt his school down. In-between jobs he was invited to work as a bouncer in a New York city Chinese gambling hall for everyone knew of his superb kung fu skills. I do not know if he ever beat anyone up for owning money….he never mentioned it. One night walking home after a few years working as a bouncer (Known as Da Siow (Hit Hand)), he saw a car with its window rolling down drive slowly by, he dashed a bit and jumped head first over the garbage into an alleyway as shots were fired at him. He got back home, slept (Probably fitfully) and the next morning looked in the mirror and saw that his hair had turned completely white (From the sudden stress and fright he said). Right away he informed his boss that he was quitting…..and he left for Montreal. When the people in Montreal’s Chinatown saw him they were so surprised because of his whole head of white hair, and he had lost a lot of weight. When my brother and I first met him in 1978 his hair was all white. 10 or 15 years later his hair turned grayish. Another sidebar: In the early 1980s sifu Wai Hong of the Fu Jow Pai (Tiger Claw Kung Fu club) ran their first competition in New York city and sifu, sidje Gabrielle, me and about 12 other students went to see it. They rented a hotel and I went to sleep at my grandparents’ place. I didn’t witness it but some of the other students did and a few told me of an attack at sifu Leung Kai. Someone had tried to club him from behind on his head with a lead pipe….fortunately sifu’s son (A Hung Gar expert who dabbled in Choy Lay Fut) was there and blocked the attack….it was not a perfect block as the pipe hit his forearm. At that time I thing sifu was at least 20 years away from New York……Chinese have long memories!!!!! I’ve some more little stories but I’ll end my long-winded stories of sifu Leung Kai…a righteous man from a very humble beginning. p.s….he got the key to Chatanooga (Pretty certain) and not Seattle (Unless he got one there also…but I don’t know that story). Thanks so much for your very detailed comment. That is a great discussion of Sifu Leung Kai’s life. The stuff about his time in NY was particularly illuminating. Did you by any chance have an opportunity to learn his Dadao form from WWII? Thank you SO MUCH for keeping Sifu’s memory alive by telling this story. Reading your words brought tears in my eyes and they help me better understand some of the things Sifu used to say. I hope your life is good. And if your mom is still with us, please say hello to her for me. PS : Thank you Ben Judkins for your VERY interesting blog and, most of all, for your articles on my Sifu. So glad to hear from you…and surprised to have found each other thru this webpage/site. Let’s keep in touch thru email; stanley_mtl@hotmail.com so we don’t use up Ben’s bandwidth. Cheers. Many thanks Ben…your website connected two long lost Kung Fu brother and sister. From the 8 or 10 combinations that I’ve seen, I’ve developed a form on my own by adding some moves from the Tiger Tail Broadsword form, Plum Flower Broadsword form and Horse Chopping Knife. So I guess you can call my form a Choy Lay Fut hybrid 2-handed broadsword form.